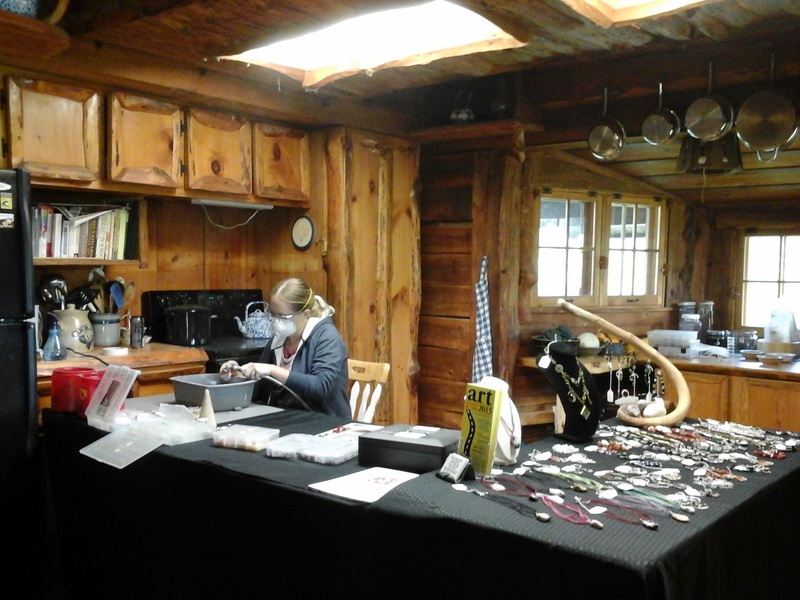 The Fall Northwoods Art Tour took place, Fri. – Sun., Oct. 9-11, 2015. Both attendance an sales were quite a bit better than the summer tour. Sharing my weaving interests and talking with visitors to Shuttle Works Studio is most enjoyable! Studio visitors ask questions! 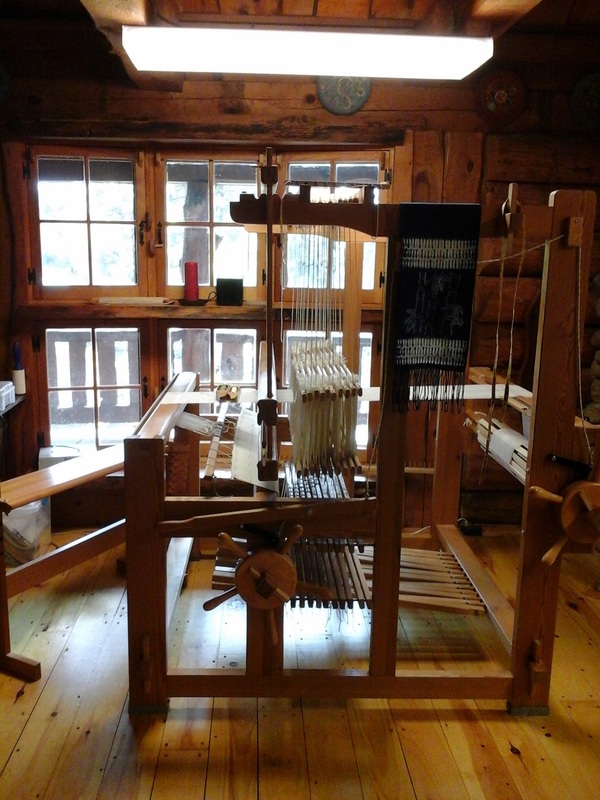 When and where did you learn to weave? How long have you been weaving? How does the loom work? This is your studio, is it also your home? Do you live here all year? Wow! Then visitors ask about what I weave, and how is it done? 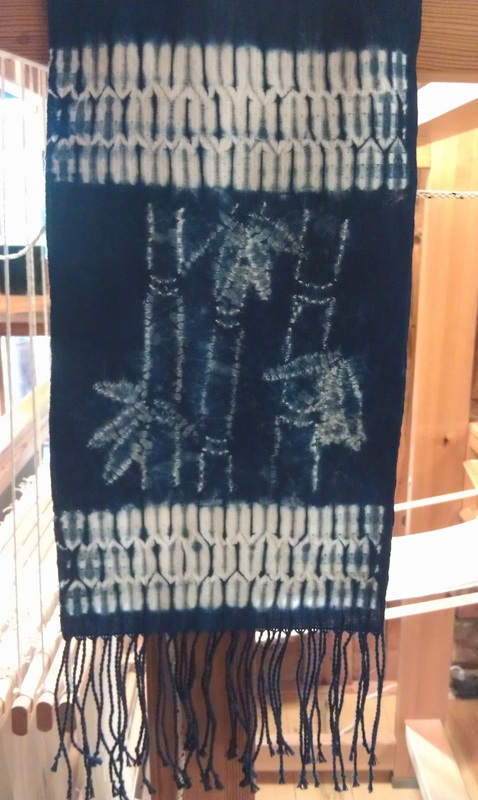 I keep a scarf and a sample, in progress, to help them understand the woven shibori process. The scarf above, is the third scarf I’ve done with a plain weave area that is then hand-stitched with a design, off-loom, before dyeing. 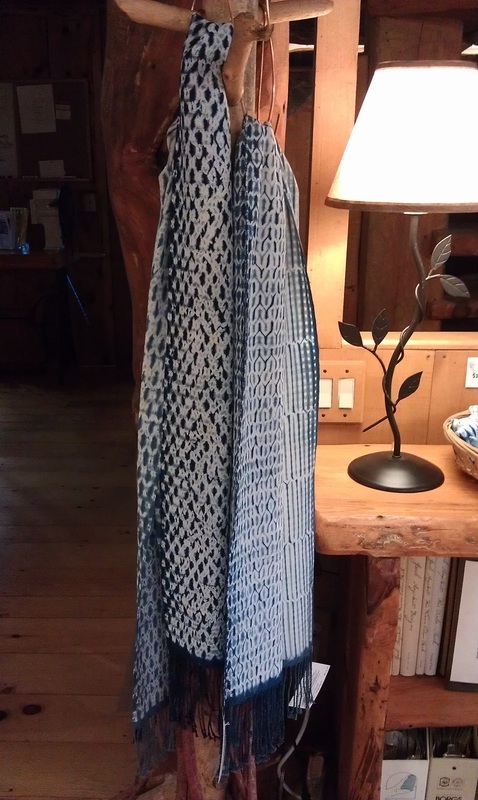 A weaving friend purchased this scarf a few days before the art tour, and graciously allowed me to keep it in the studio until after the tour; it is in her possession now. A new customer liked it so much, she ordered something similar for herself, leaving the design and details to me. Visitors are also fascinated by the single unit drawloom, and how it works. “You must have a lot of patience,” is often heard when they they see it demonstrated. 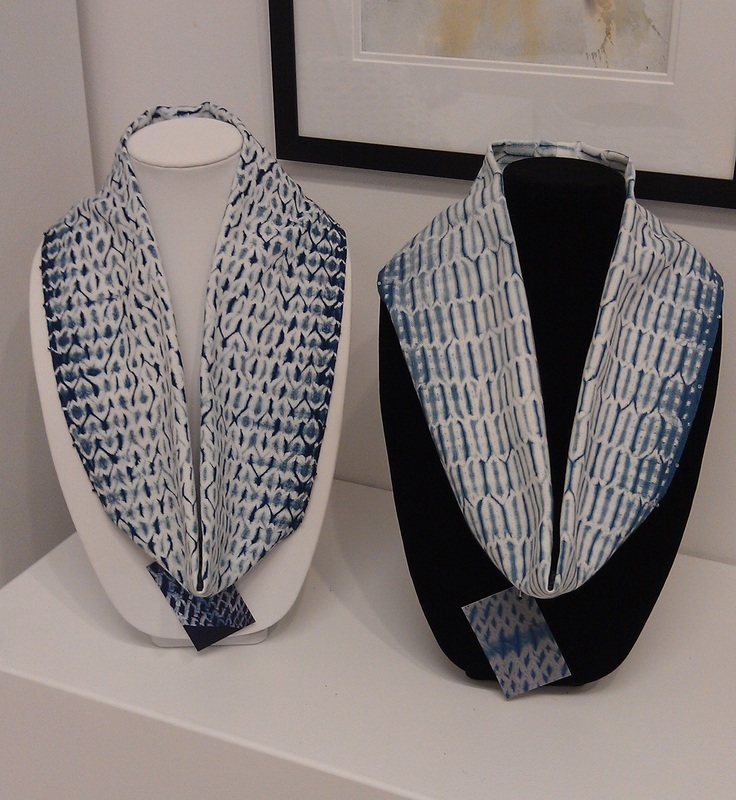 New woven shibori scarves for sale during the art tour. 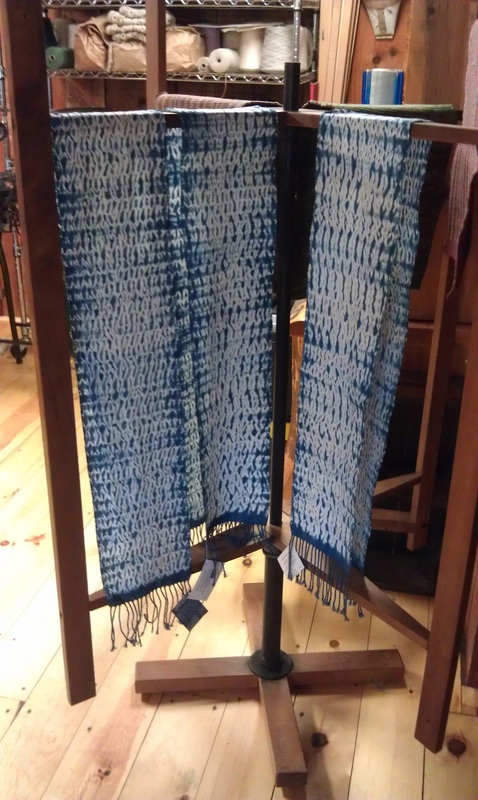 Happily, most of the woven shibori scarves and batik runners were sold during the art tour. 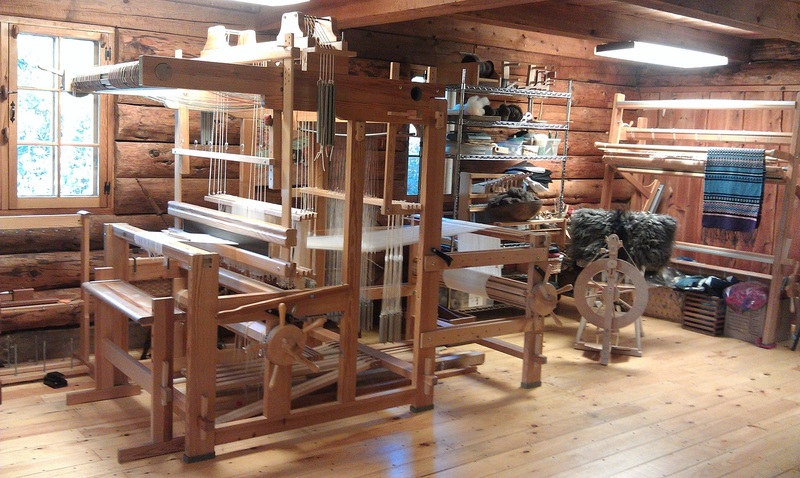 Here, the warping mill doubles as a display rack for more scarves and three or four “rag” (batik) table runners. I had a nice stack of woven shibori samples, pieces left from the ends of warps, along with indigo-dyed PFD cotton swatches that I use to “test” the vat before immersing the handwoven scarves. 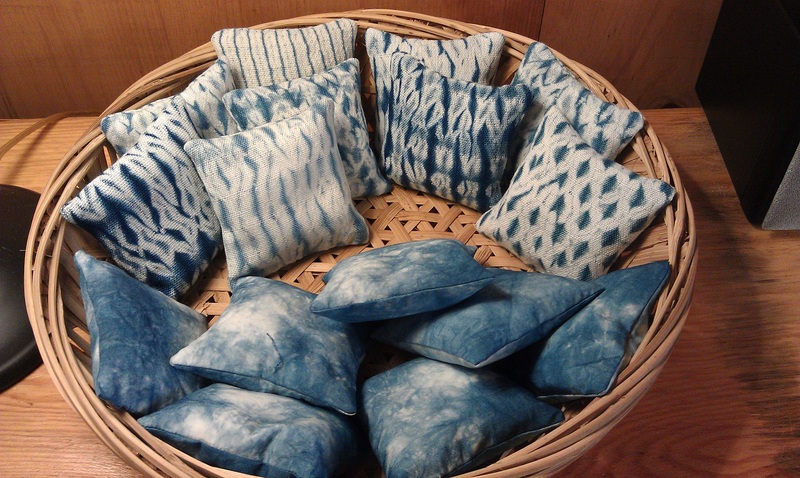 I’d thought about what I might do with them, and decided, three days before the art tour, to make sachets. Muslin squares were stitched together, filled with dried lavender, and hand-stitched closed. Then the outsides were rotary cut, machine sewn, the inside “lavender pillow” placed inside, and the outside was hand-stitched closed. The fragrance is wonderful! Several sold, a couple friends each received two, and now I need to stitch up more and take them to Artistree Gallery in Land O’ Lakes, along with new woven shibori scarves that are in the process of being woven. 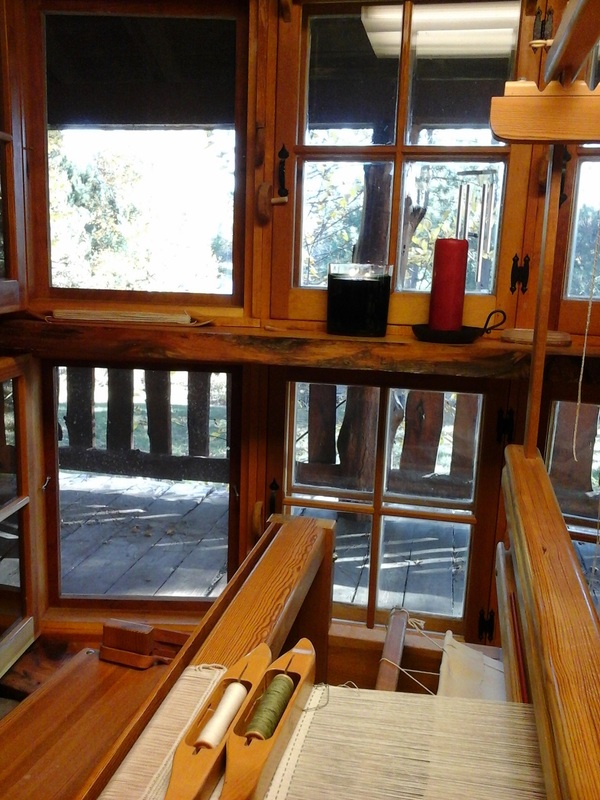 Autumn view, from my loom. My view of the lake and autumn trees. 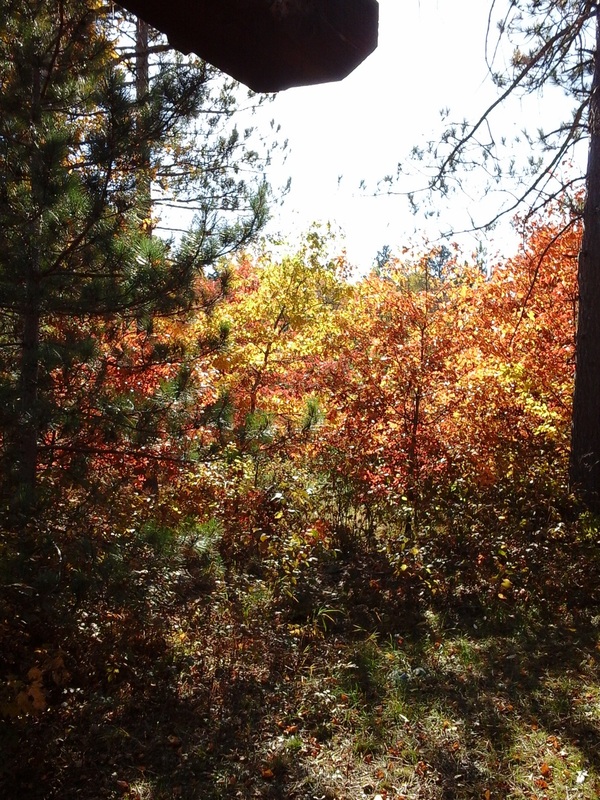 I stepped out onto the porch, walked to where my loom bench is, an took this photo,… Torch Lake, and woods in autumn. 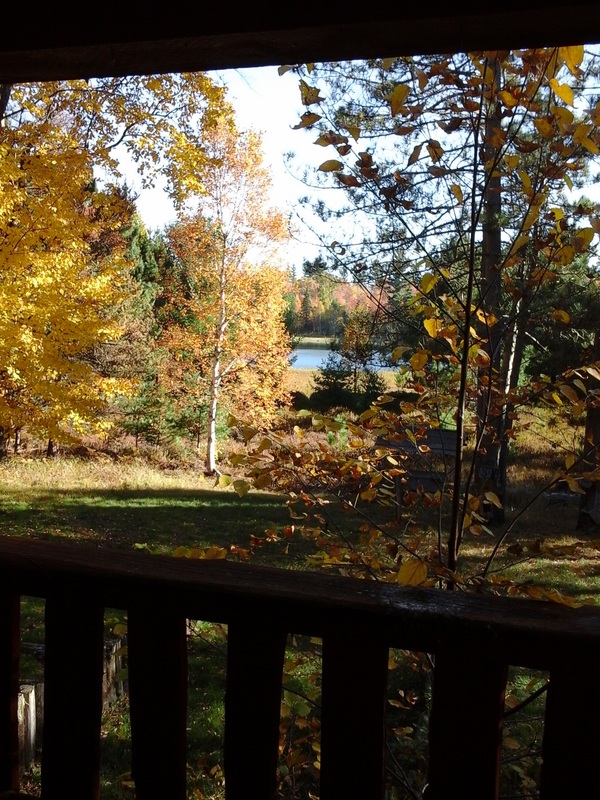 Looking west from the end of the lakeside porch. The oak tree leaves are particularly brilliant and colorful this fall. Maple, birch, and other leaves a bit less so, and they lost their leaves quickly. The contrast between the evergreens, colorful leaves, and blue sky is beautiful! Now, it is time to get back to my loom, weave many more scarves, sew more sachets, an of course, begin “sock season.” A few orders came in, along with a scarf order, so I have many weeks of work ahead of me, I will also be trying woven shibori as a garment before too long, and I am really looking forward to that! Sarah Zindel, Celtic Wolf Studio, jewelry artist. My daughter, Sarah Zindel, Celtic Wolf Studio, was my guest artist on the fall art tour. She demonstrated shaping of stones an enjoyed discussing jewelry and stones with our many visitors. 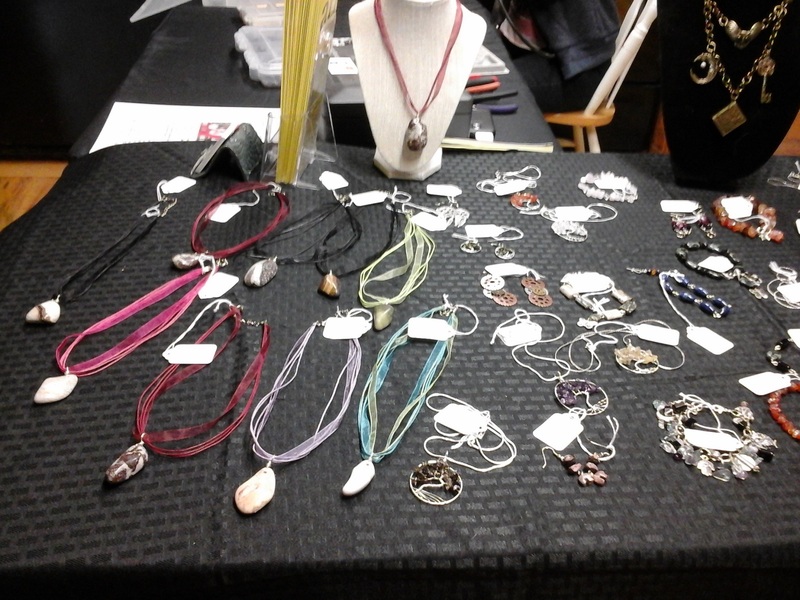 Sarah Zindel’s jewelry displayed for sale. 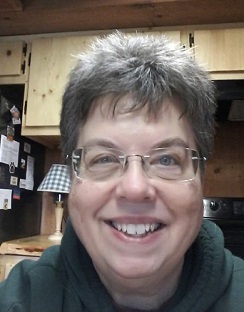 Sarah currently specializes in variations on “Tree of Life” designs, along with necklaces made from stones and fossils collected along the Lake Superior shore. All in all, it was a very enjoyable art tour, an we’re looking forward to welcoming people to our studios in 2016!